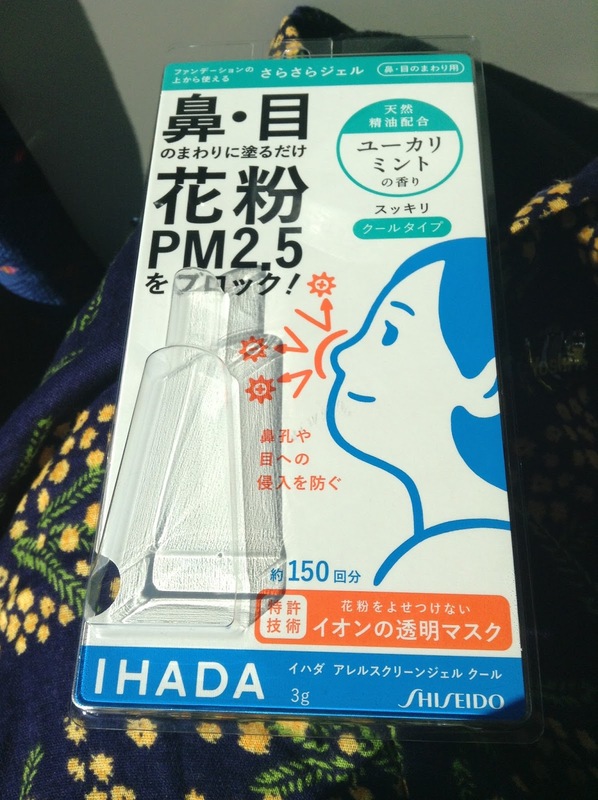 hay fever 花粉症対策 My least favorite part of Japan has to be the allergy season... which for me is from March to early May, but longer or shorter for others depending on what you're allergic to, obviously. 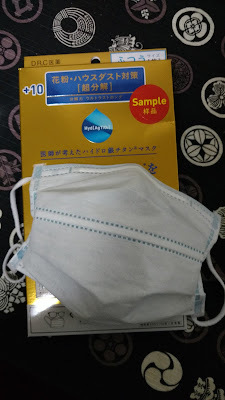 Probably because of the crazy number of Japanese sugi trees スギ planted, the pollen count is just ridiculous! 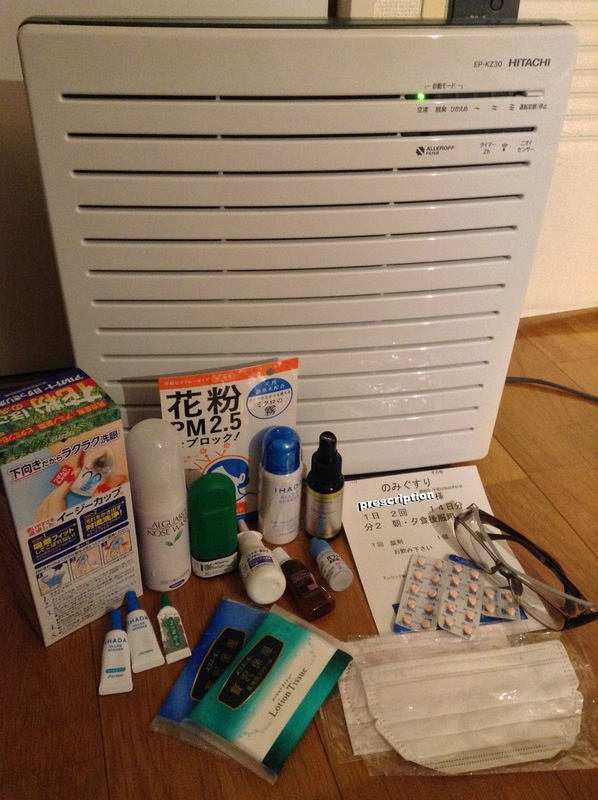 Even though I have hay fever 花粉症 in other countries too, my first year here, I remember waking up at night because I was gasping for breath, unable to keep my airway open while asleep! That's how bad it was. 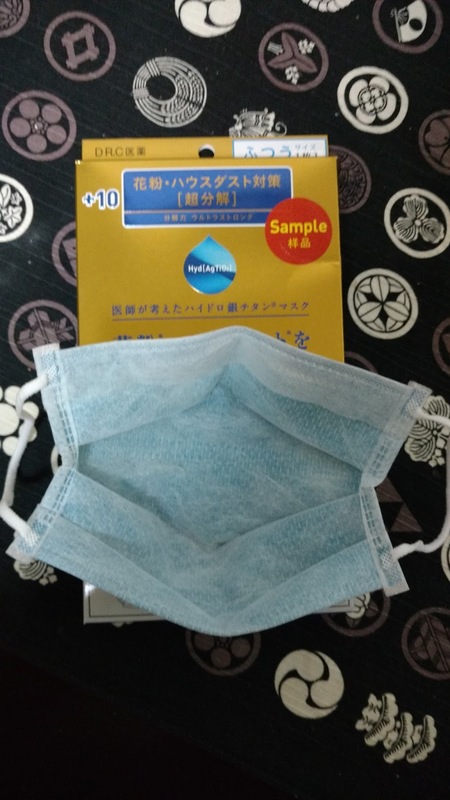 For me, the Japanese cypress ヒノキ season that follows the Japanese sugi season isn't as bad/long - you can check the pollen forecast by region at 花粉飛散予測. You can also check hourly pollen forecast during hay fever season. Buying over-the-counter drugs wasn't effective for me, plus the pharmacists make you go through an actual binder full of information before they're allowed to sell the medicine to you. 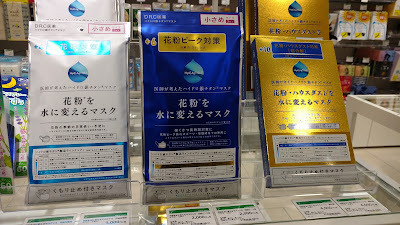 Pulling the gaijin card of "I don't understand" doesn't work because they will insist that if you don't understand, you are not permitted to buy it. I wonder if people actually do hay fever drugs recreationally? 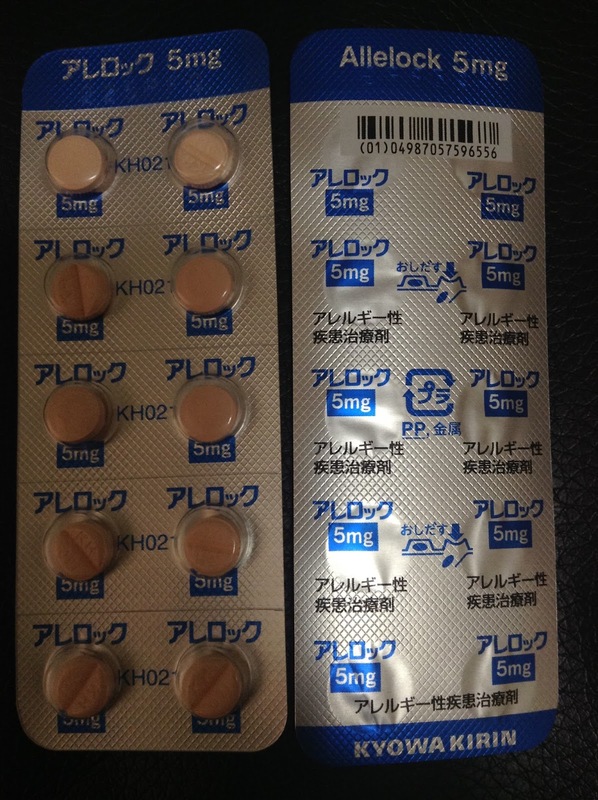 Following a Japanese friend's advice, I went to the hospital for cheaper and way more effective prescription medicine and got Allelock アレロック... these tiny pink pills have been the only effective meds for me so ask your doctor about it! The catch is, it makes you super sleepy all day, but nothing a little coffee won't fix I guess... and long naps! All my symptoms were gone after taking the prescription medicine, unlike all the other allergy drugs I have taken over the years... so being a sleep-walking zombie for a couple of months seems like a small price to pay. For safe measures, I still use hay fever goggles and a variety of other products to block the pollen from entering my system, the effectiveness of which are debatable - but better safe than sorry, amiright?! Let's look at some of these products, shall we? eye drops, nose cream & spray There are a few brands of these tiny tubes of clear cream that are supposed to block pollen from entering, well, your nose. 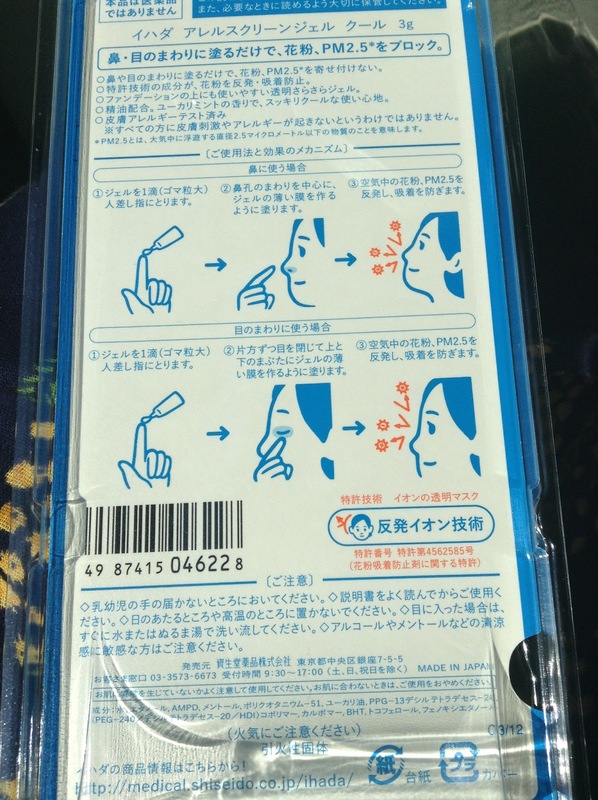 You apply a tiny bit inside your nostrils and it provides instant relief if nothing else. Some you can smear around your eyes as well. It's the tiny white and blue one in the photo. 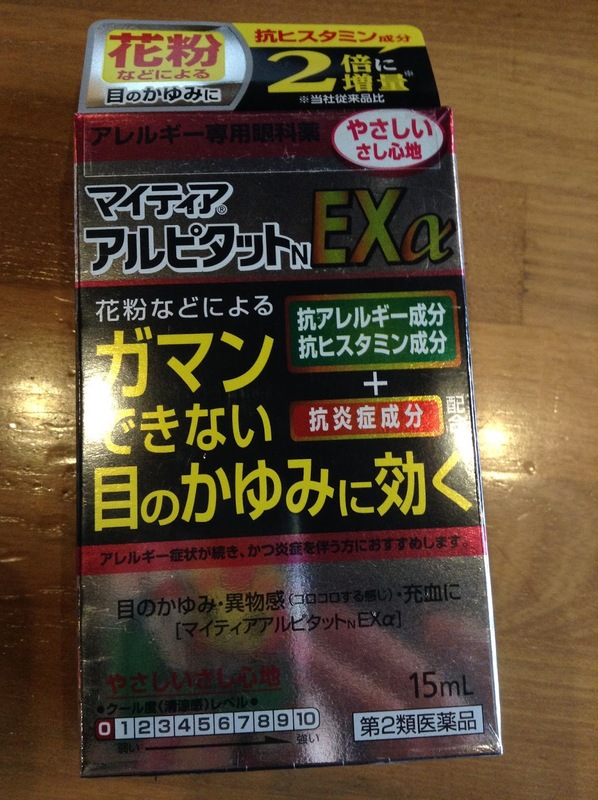 This brand of anti-itch eye drops really works for me! There are 2 types, one stronger than the other - again, instant relief to keep you from scratching your eyes out. 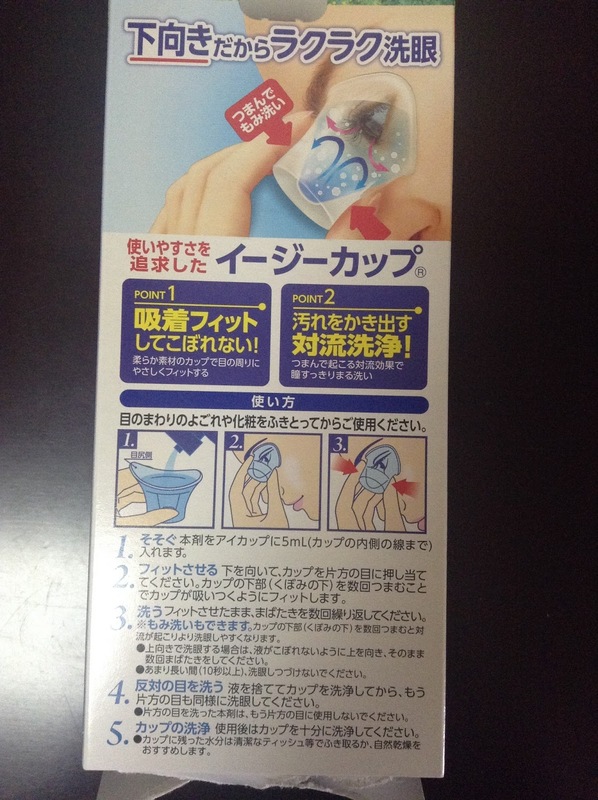 The eye wash helps and mostly just makes me feel better 'cause I can imagine it getting rid of all the pollen irritating my eyes. 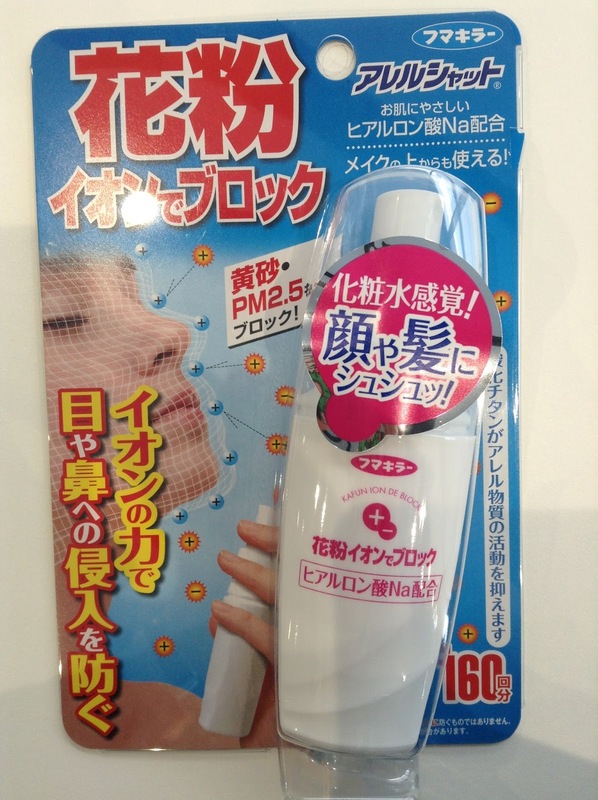 drawings explain it all Now, I really doubt if this face spray does anything, but what the heck! Just in case, right?! It's supposed to create an "ion" coating around your face, whatever that means. If anything, I find the idea hilarious. 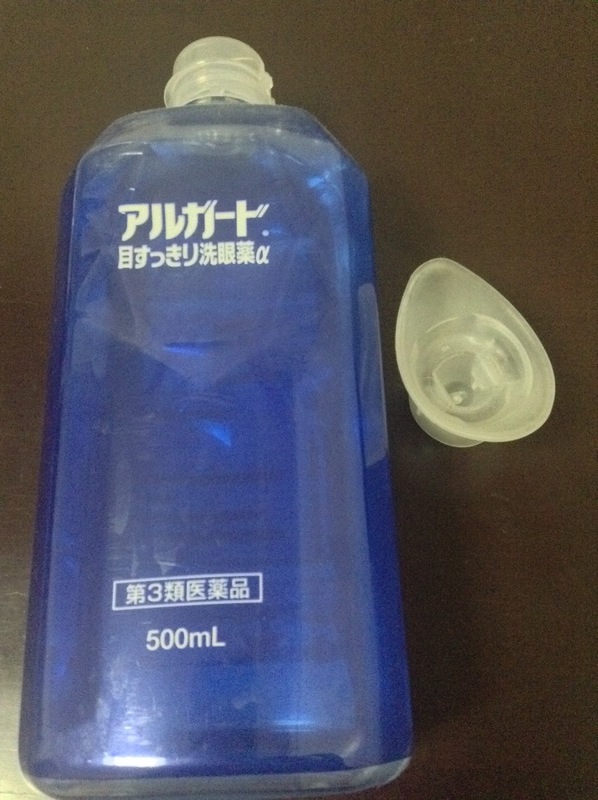 I suppose it's better than the aromatherapy room sprays you can get since it's refreshing, doesn't smell, and isn't too pricey at about 1000 yen per bottle - use it like a toner. 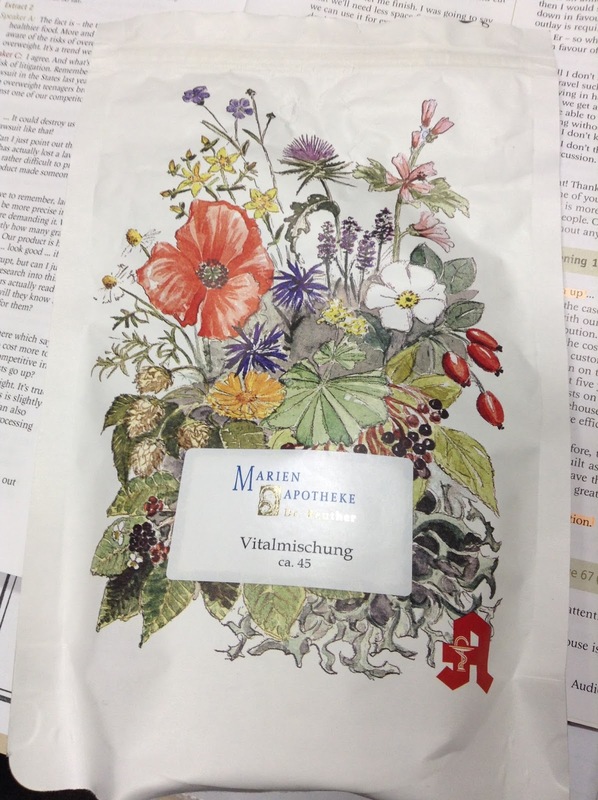 nettle tea / soba tea A student told me he was off the allergy meds after having this German chrysanthemum tea... 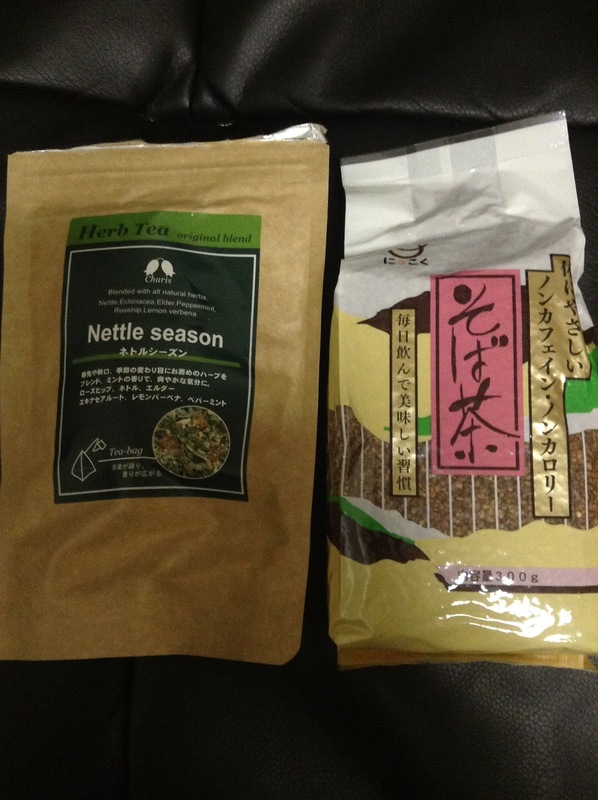 I looked it up online and it seems a bit on the pricey side so I've got some mint/nettle herbal tea and soba tea which are supposed to help! 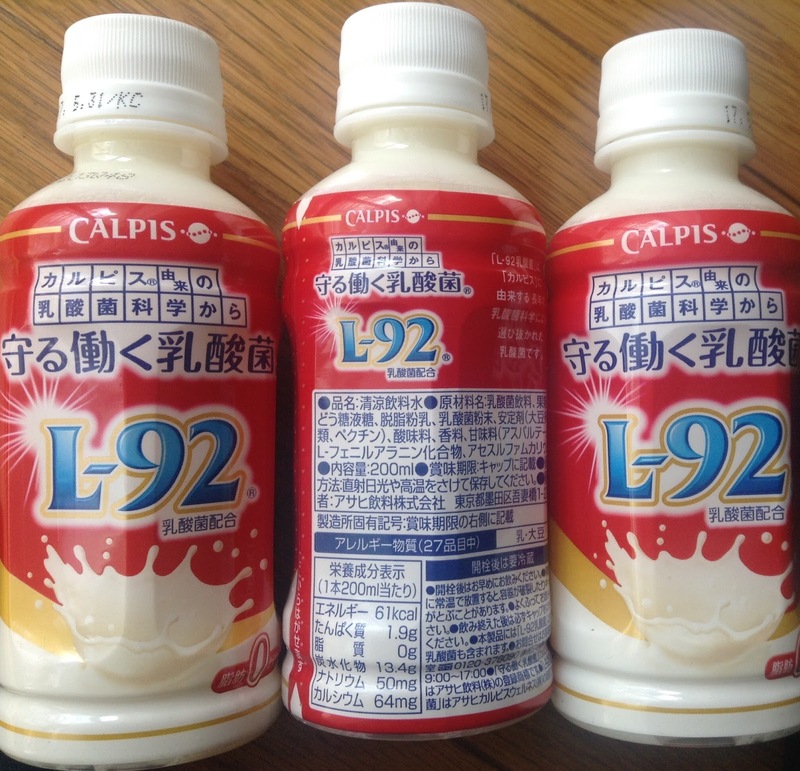 Tiny red bottles of L-92 yogurt drinks sold at supermarkets are also supposed to help (L-92 乳酸菌 in table form is available online)... and strawberries apparently. I ate a lot of strawberries last hay fever season but not really sure it helped, but they were delicious anyway! t h i s a c t u a l l y w o r k s ! This year, 2018, you can occasionally find these super pricey masks in select drug stores and Tokyu Hands 東急ハンズ. 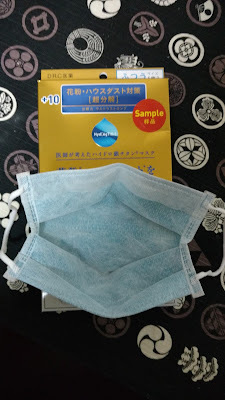 The weakest potency, which is a 4+ didn't really do too much for me - maybe slightly better than a regular mask that just blocks out some of the pollen you breath in, but much more expensive at 3 for 1000 yen. 3 "strengths" available Today I tried the strongest one, 10+, out all day and much to my surprise, it really works! 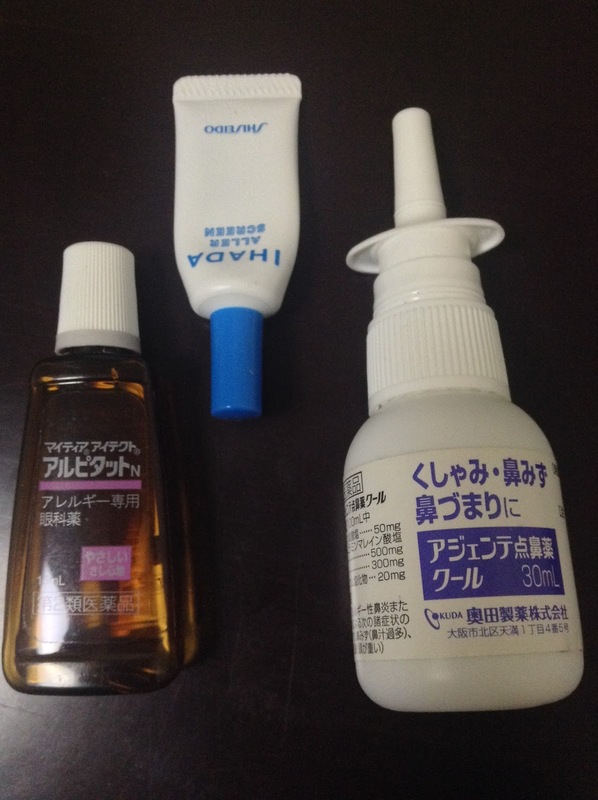 My eyes aren't even itchy (first time in the whole month of March)... so I guess it works! 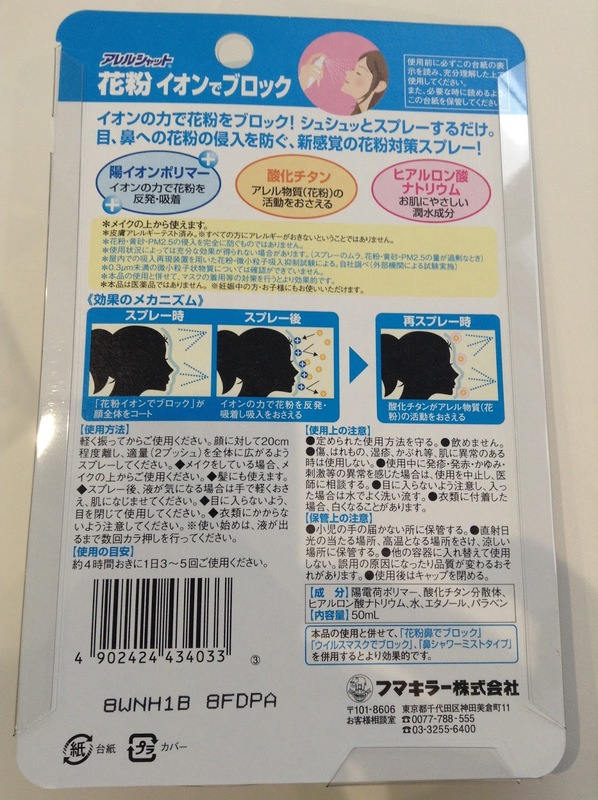 I find that it does still fog up glasses though, despite what it says on the package. If you've got really bad hay fever, I recommend trying it - it can be worn over 7 days apparently so might just be worth it. 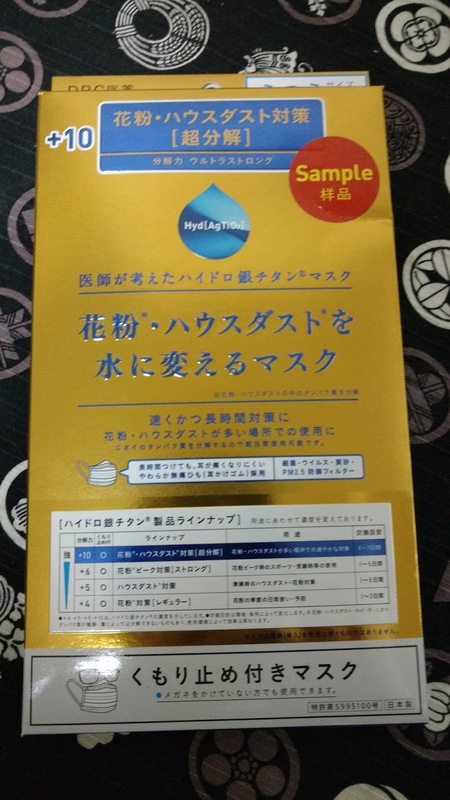 I bought a sample pack of 1 that came with a small towel for 1000 yen but they're normally 4 for 4000 yen... yikes!